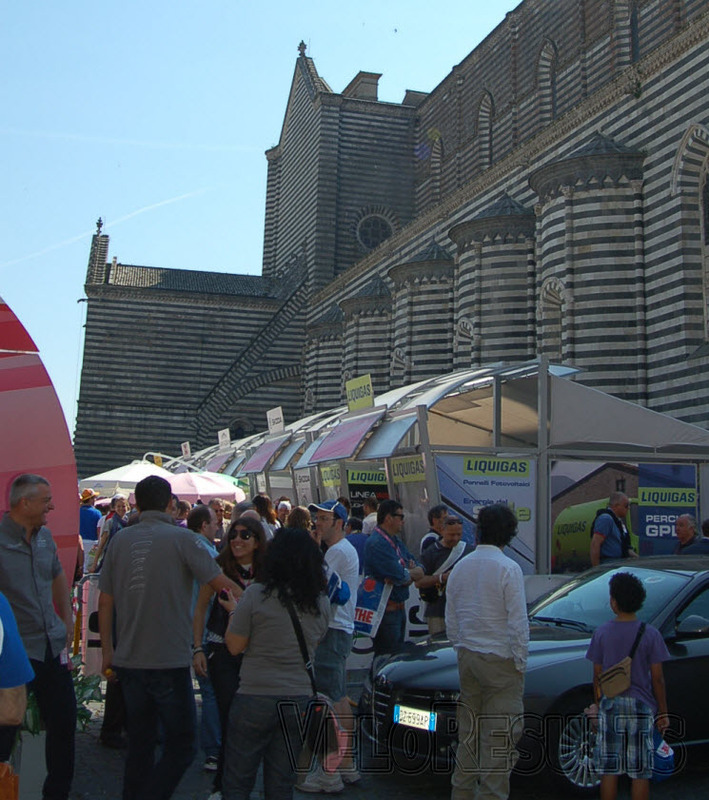 Viktor wouldn’t like it here at the Giro d’Italia, the cobbles are big flat things and the locals all dress trendily – not a pair of Belgian basket weave shoes or a tank top in sight. And the fans don’t come straight up to you and ask you a string of questions, once they realise you’re not a local. And wine? What the hell is that? 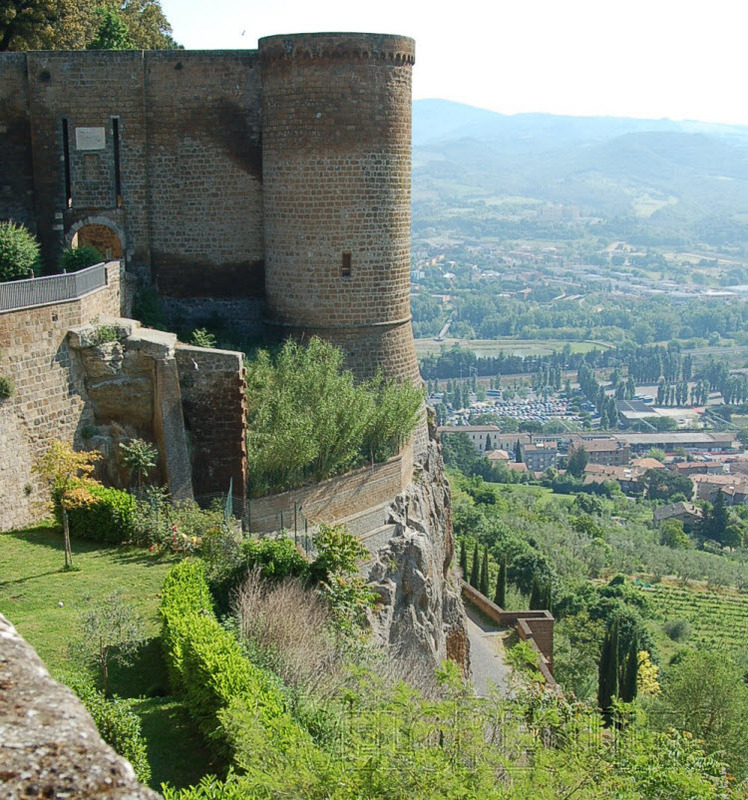 But it has it’s compensations – hill top towns, nice weather, pretty girls, pizza… and grappa. 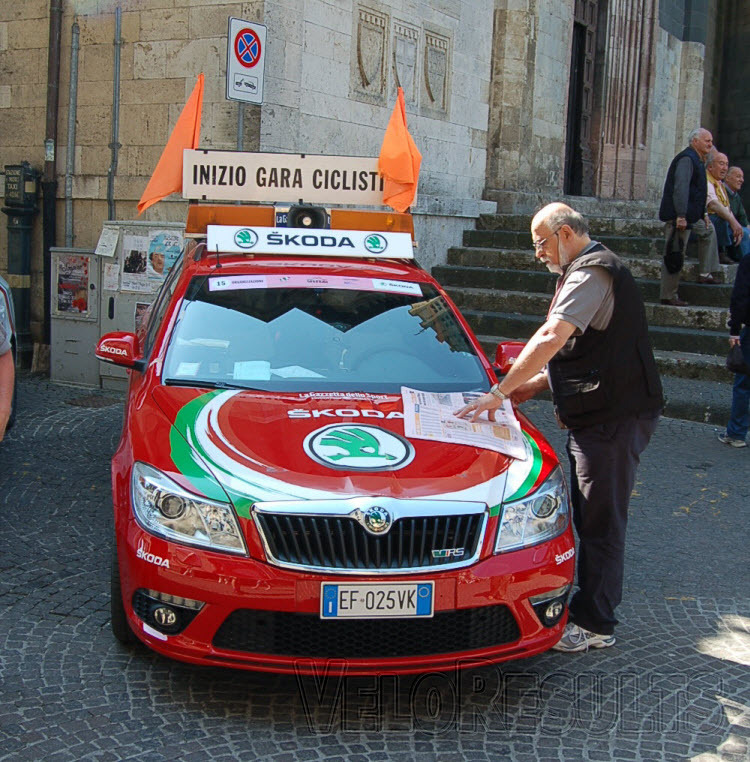 We’re en route the partenza at Orvieto, latched on to the Vittoria neutral service convoy. The sign on is spectacular. 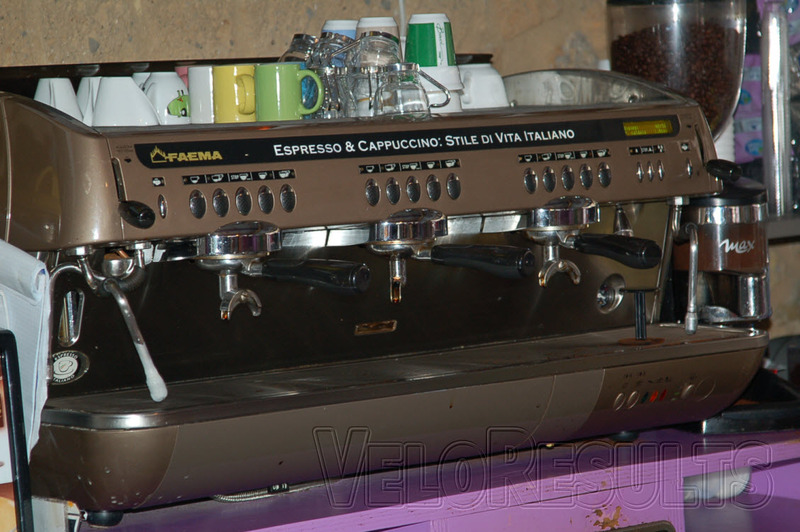 The announcer never let’s up with the patter; ‘Stefano Garzelli! Rinaldo Nocentini! 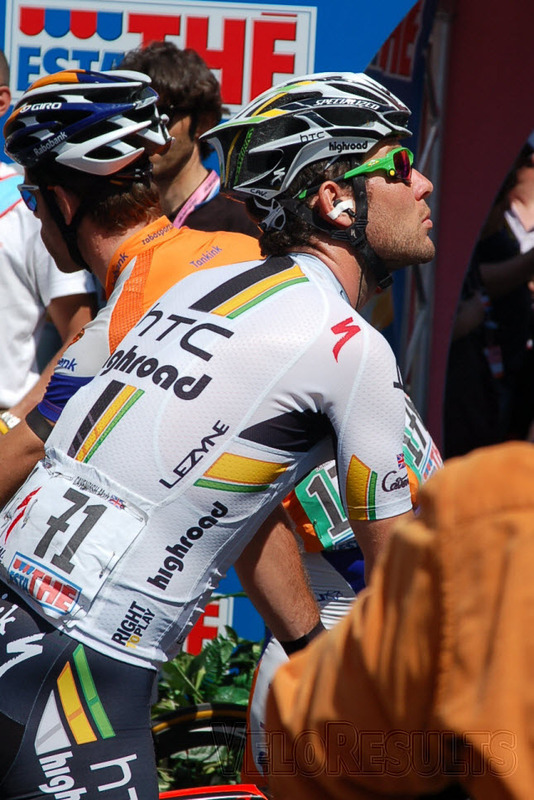 Adam Blythe! 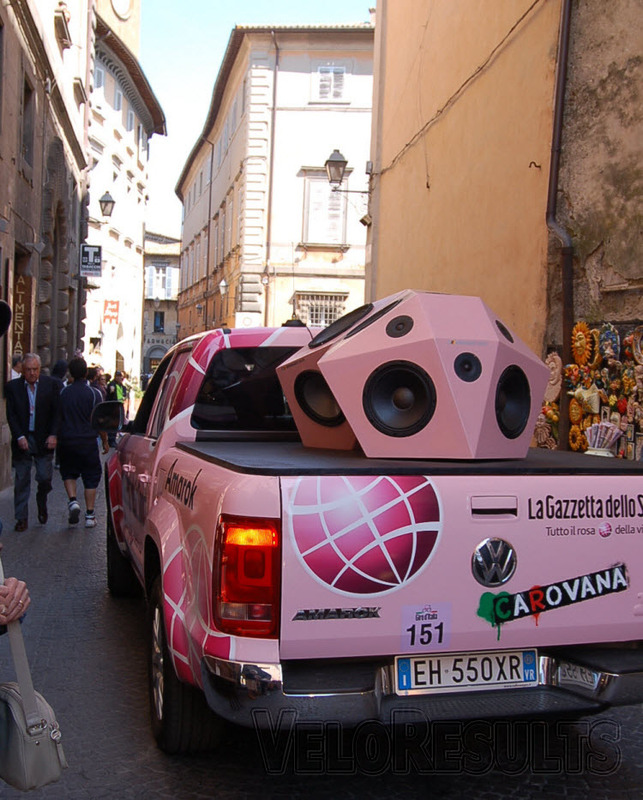 Stefano is still immensely popular. 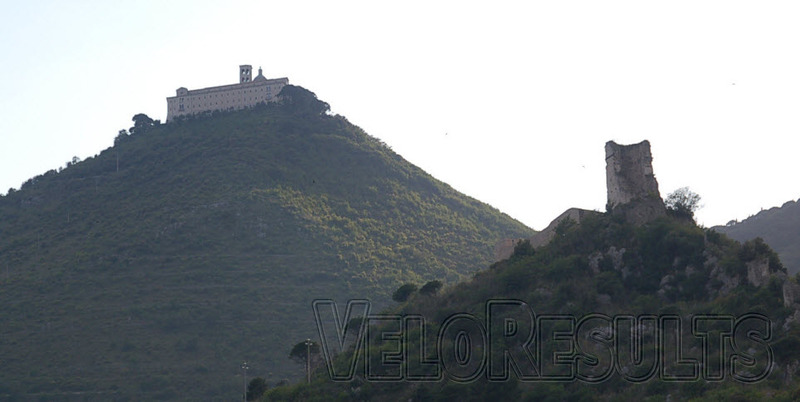 Does Nocentini harbour ideas of another leader’s jersey? Matt Rabottini takes baby steps to save his legs. 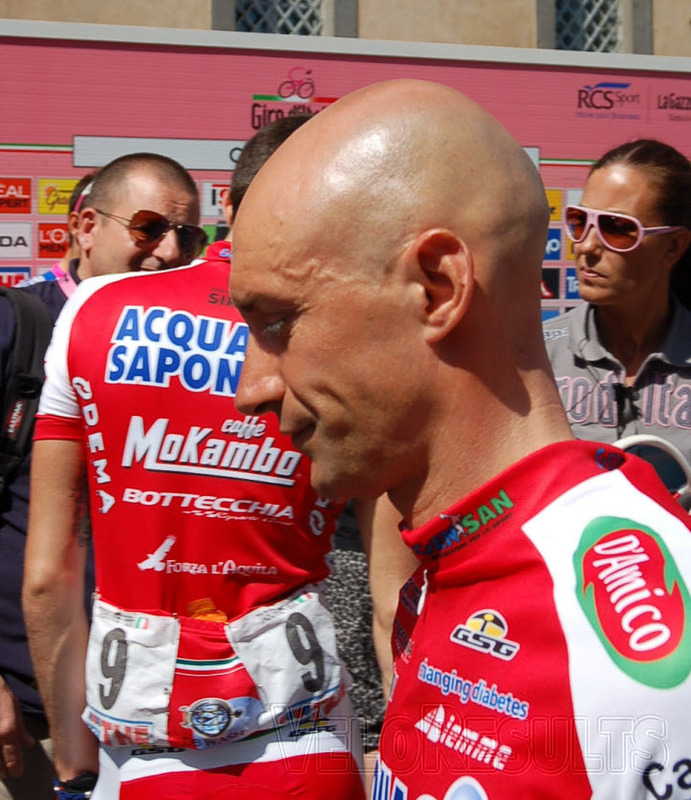 Gianni Savio doesn’t look sad and serious, he’s had a fourth place, a win; and yesterday his boy Serpa was third. 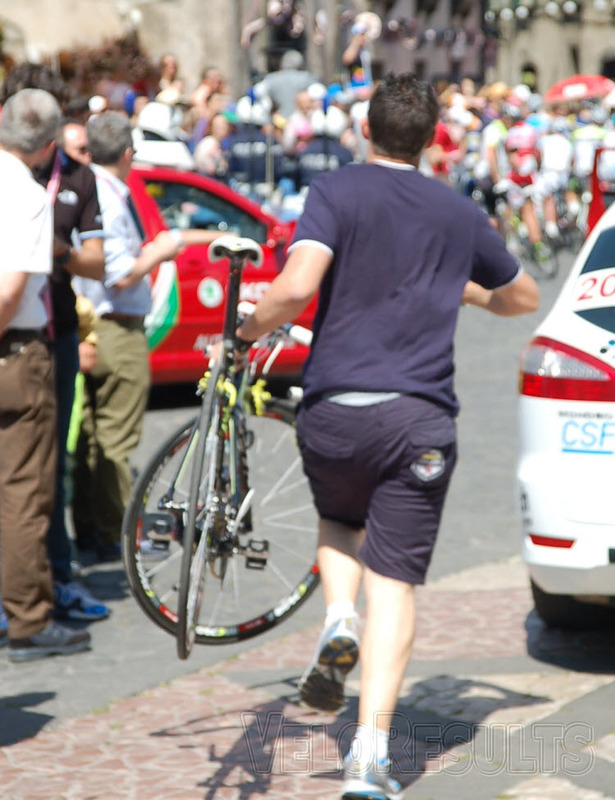 Today was a stage for the breakaway riders, they nearly pulled it off, but not quite. The finale was a good one, with the last escapee not coming back ’til 1700 metres to go. Francisco Ventoso isn’t a name that’s bandied around a lot but he’s a quality finisher. 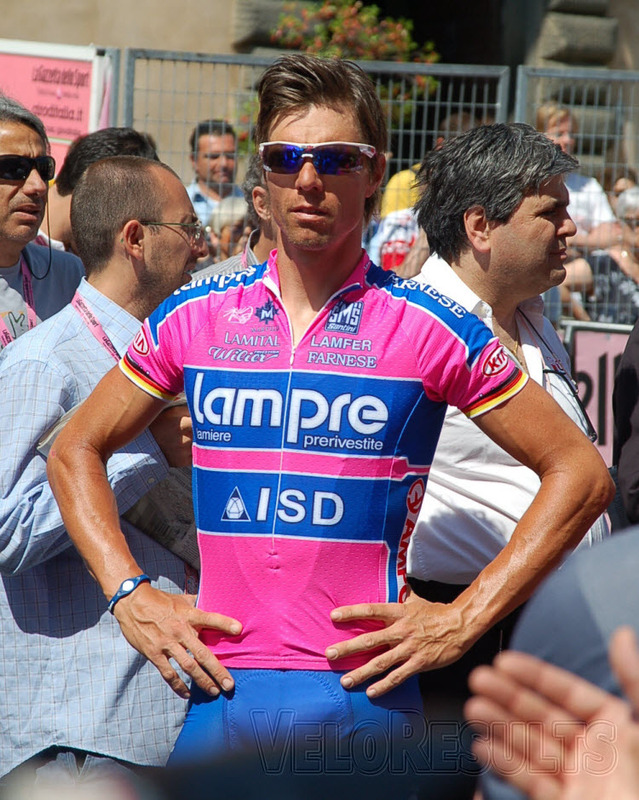 He was a very successful U23 rider and then turned pro for Mauro Gianetti’s Saunier Duval team. 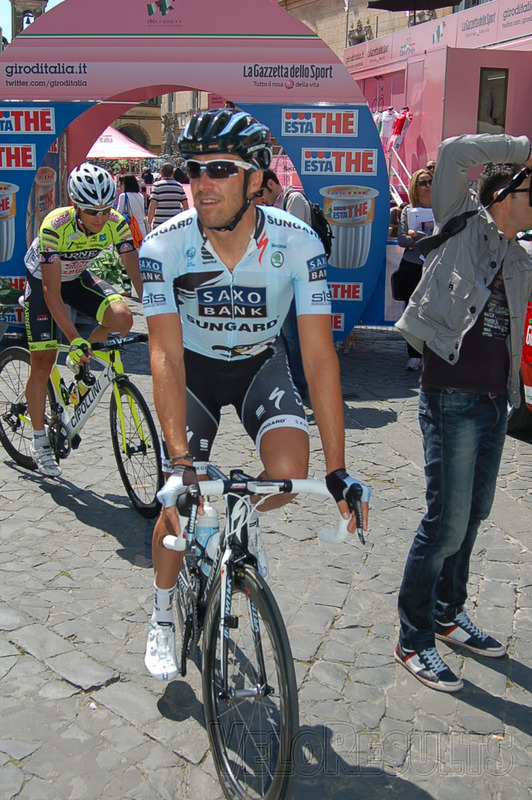 He won the USPRO in Philly – a very competitive race – in 2004 and in 2006, the third stage of the Vuelta. 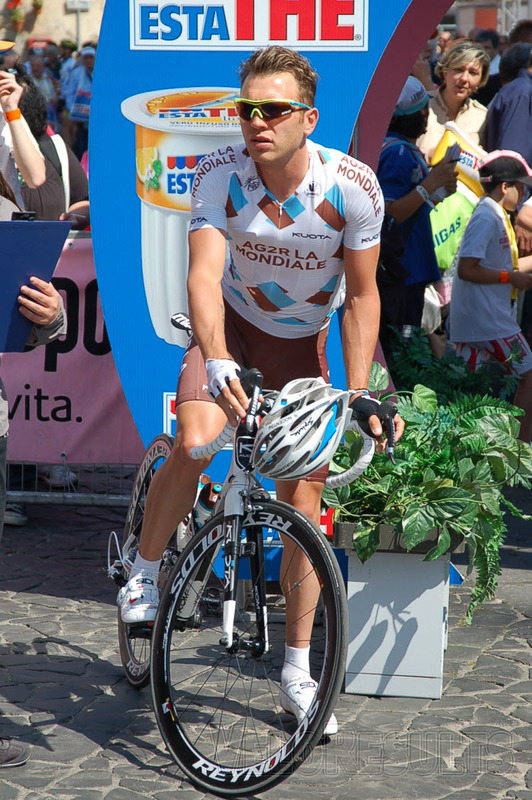 Despite three wins in 2007, Gianetti let him go and he went to the small Andalucia-Cajasur team for 2008. 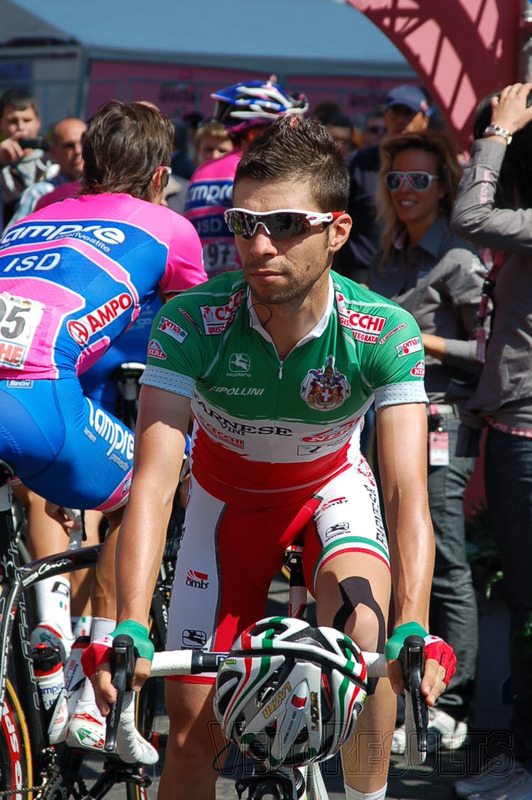 In 2009 with the Italian CarmioOro team he took nine wins – and in 2010 took another four, one of which was Paris-Brussels. Yesterday was his fifth win of 2011 to go with stage wins in the Tour Down Under, Andalucia and two in the Castilla y Leon – but Ben Swift got the better of him in the last stage, there. 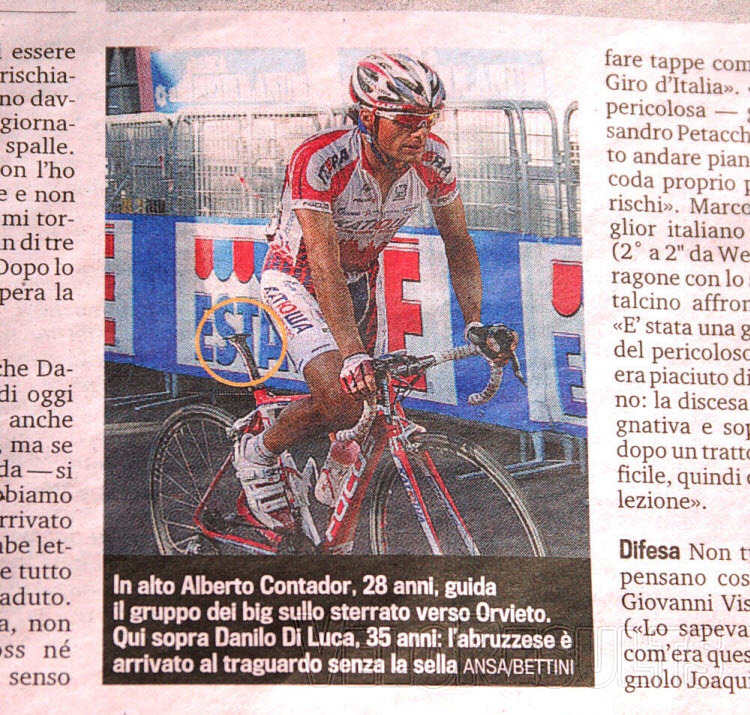 Ale Jet was second – and like Ventoso – was so wasted he had to sit on the tar to recover from his efforts. Cav? The last we saw of him was dangling right at the back on a rise – the end is nigh at HTC. He’s unsettled; and the team personnel just shrug and roll their eyes at the mention of his name. 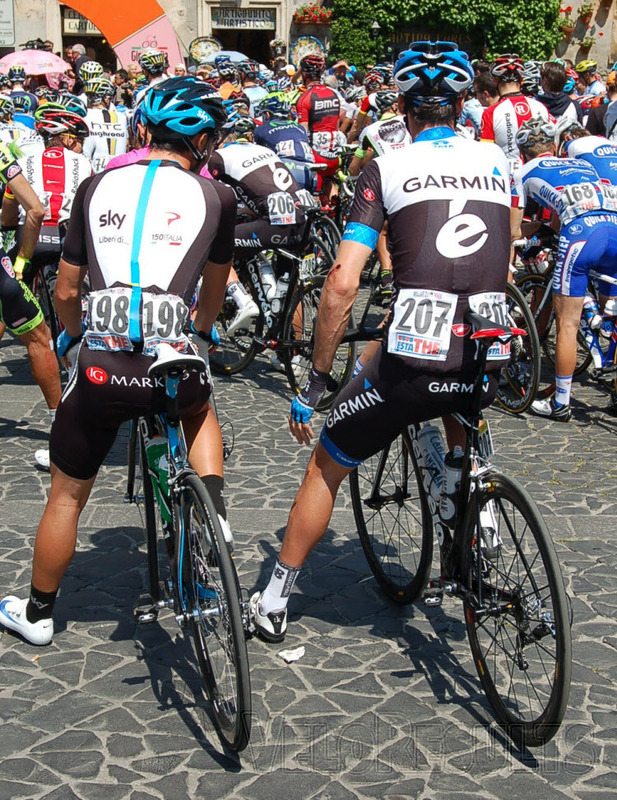 We reckon something’s up with Cav and his team. 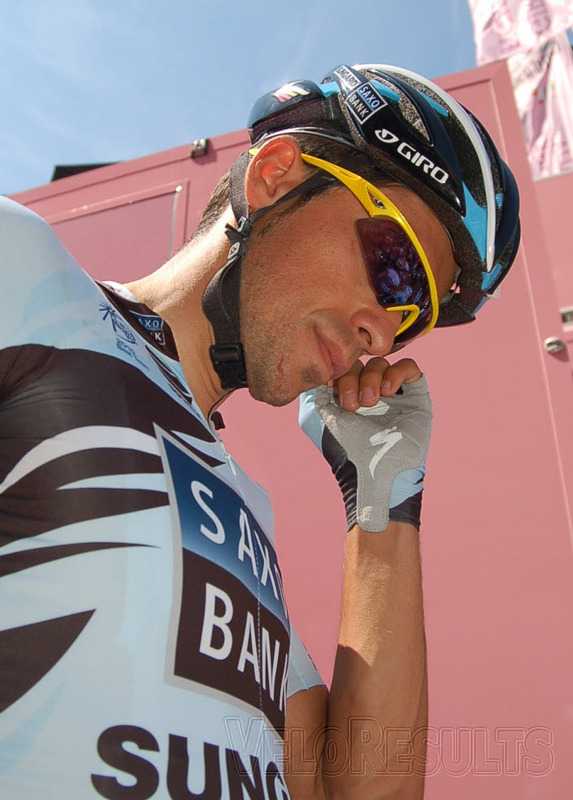 Maybe he’ll get his proper motivation back at BMC – but we didn’t say that. 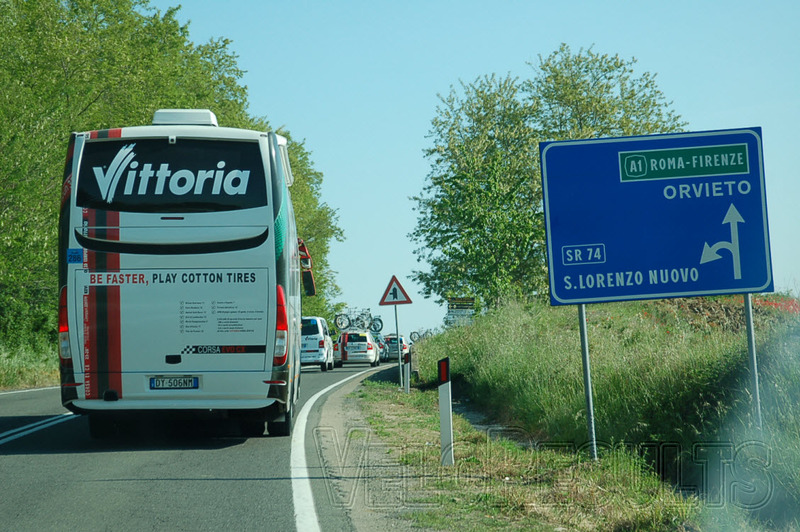 As far as our Giro goes, for the strade bianche stage we tried to do too much – work the buses, the roll out, race route and a lot of time on the dirt roads. 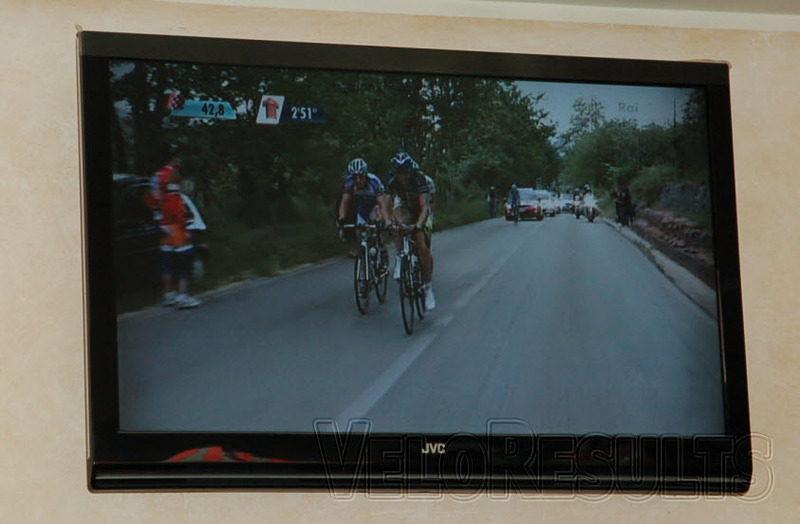 Yesterday the plan was to take a bit of pressure off; do the ‘fan’ thing at the start then watch the finalé on TV in a bar near to our digs – missing out driving the parcours. Being fans for the day. All went well until it was ‘connect to the internet time’ in the hotel, when it was time for that horrible frustration that only hassle with computers can generate. We ended up having to copy the pictures on to a memory stick then send them via the – very slow – hotel computer. That side of things should have been a doddle, instead it was a nitemare – but that’s how it goes. 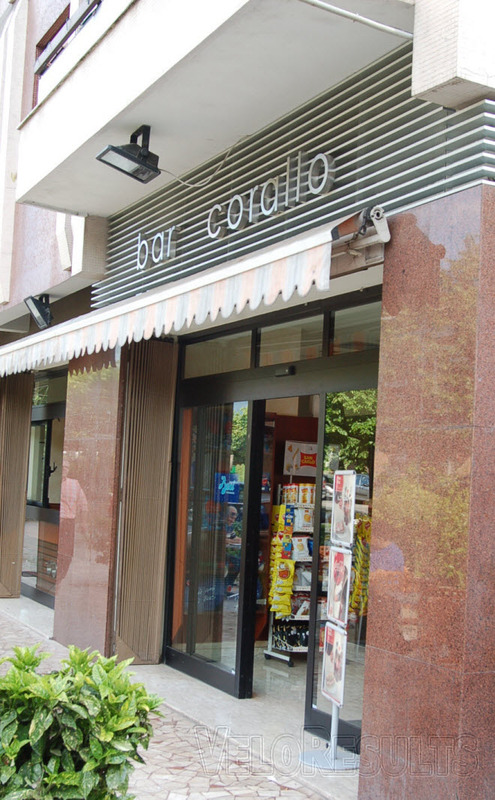 Fortunately, there was a good, cheap restaurant in the hotel so we didn’t have to stot around Cassino – a grey, uninspired ‘anytown Italia’ kind of place – to try and find a restaurant. 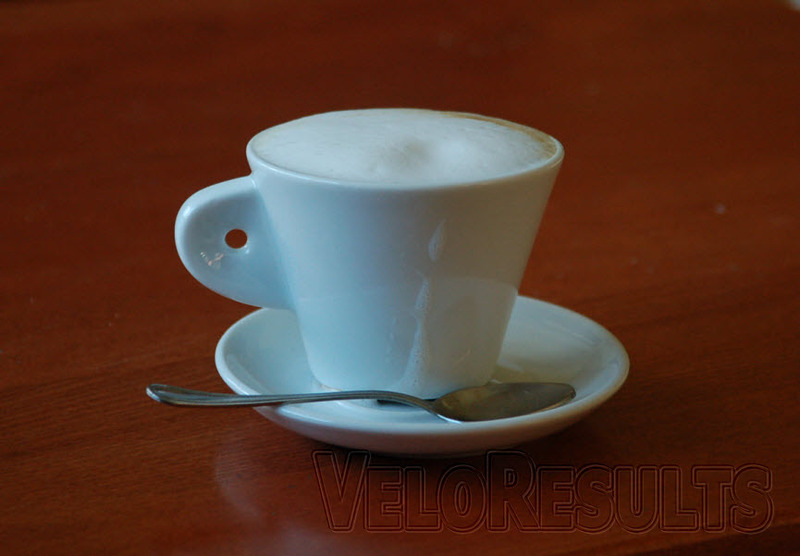 Today (Friday) is the first real mountain top finish – the Cat 2 Montevergine. 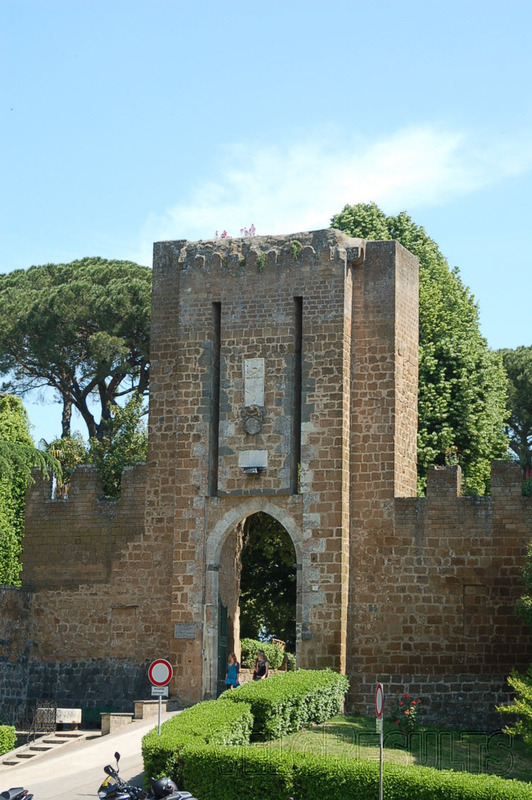 As for the start town – Maddaloni; don’t book it for your holidays folks! One of the guys who operates the vans which sell the Giro paraphernalia recognised us from our duels out on the road, gave me a present of a ‘man purse’ and insisted on a photo. 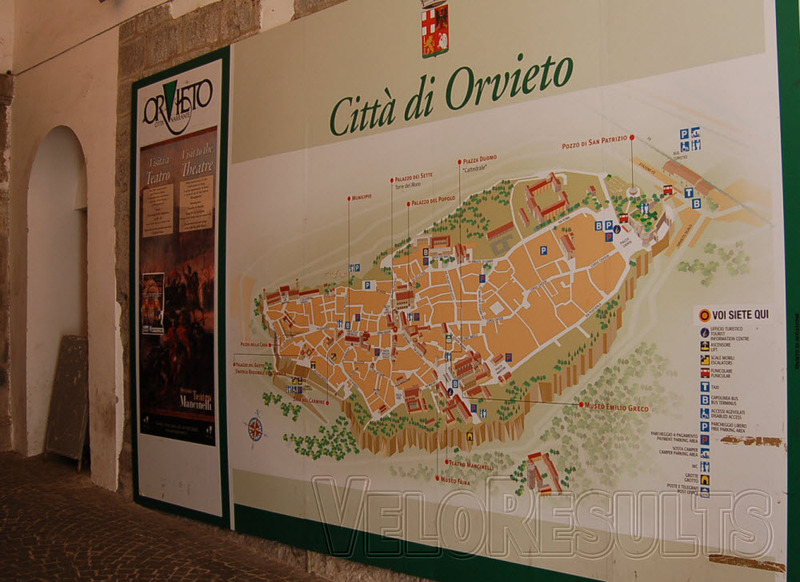 Orvieto sits high on a volcanic plug, dominating the surrounding country; the old city walls are still there. 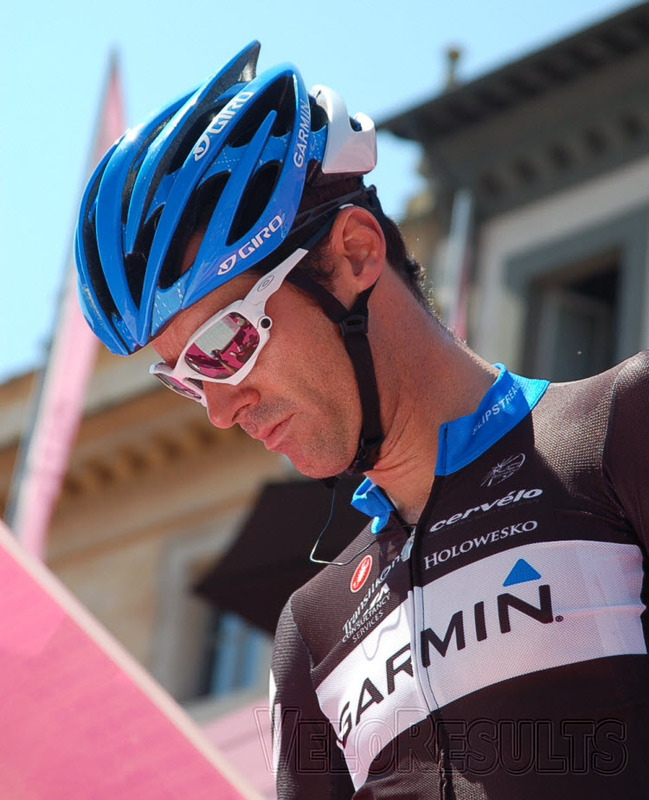 You have to accept that the old strade bianche ain’t easy at the best of times; never mind with no saddle – as was Danilo’s fate. 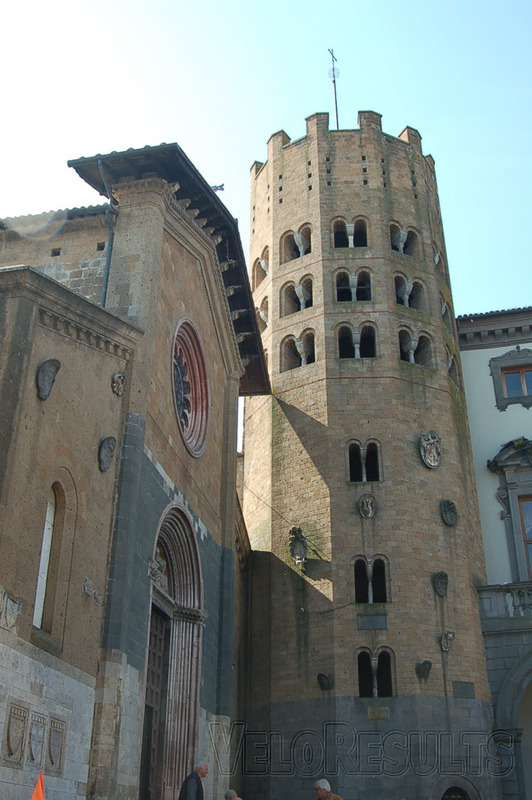 Part of the city walls. 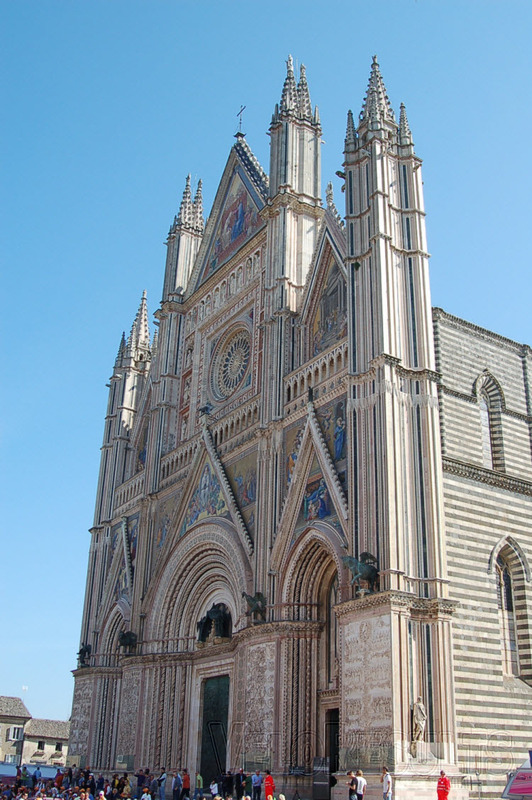 The Duomo – the glorious layer cake of a cathedral outside which was located the signing on. 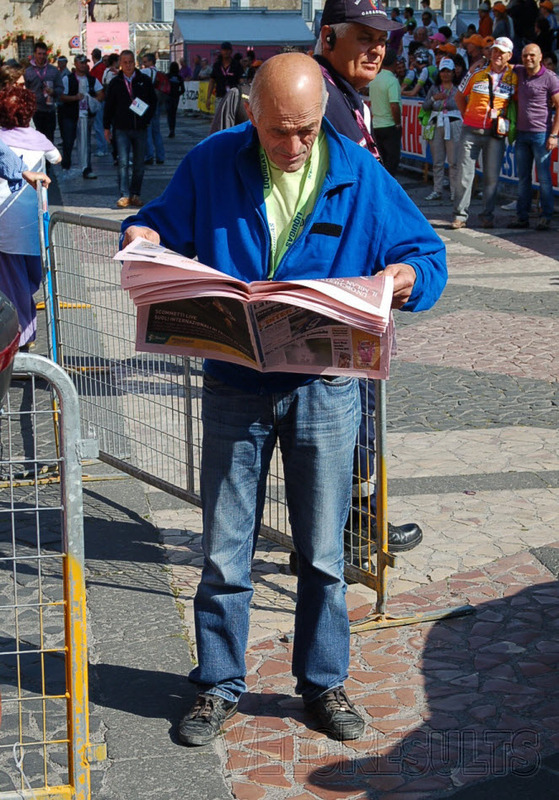 The Gazzetta forms most peoples’ start to the day. 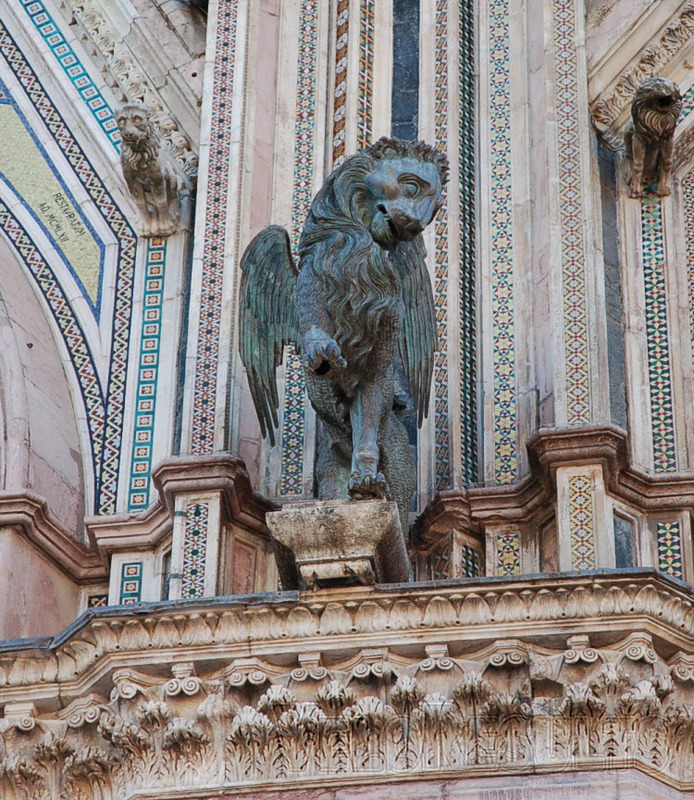 Amazing detail on the cathedral. 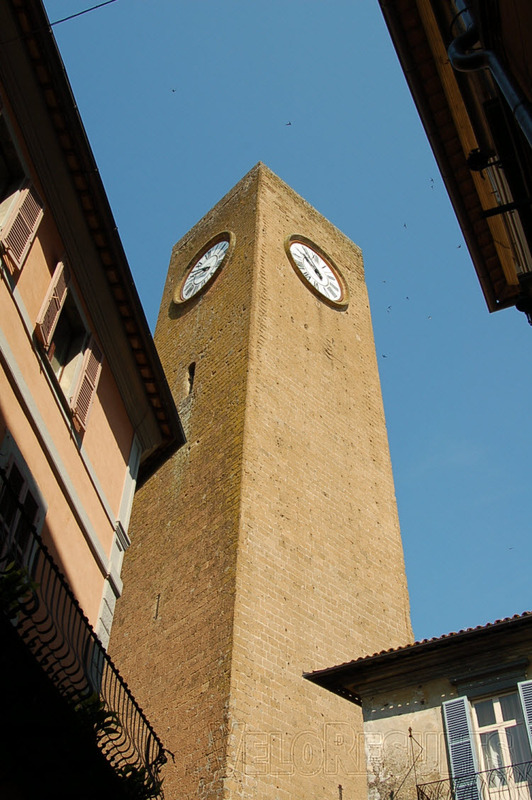 The city is also famous for it’s subterranean Etruscan tombs – some of these date back to the sixth century BC. 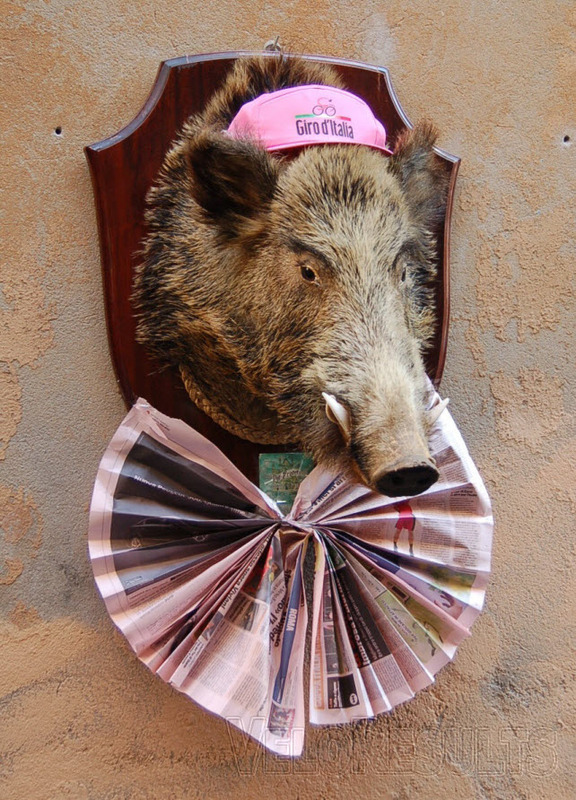 Even the mounted hogs join in the fun. We did the tourist thing today. 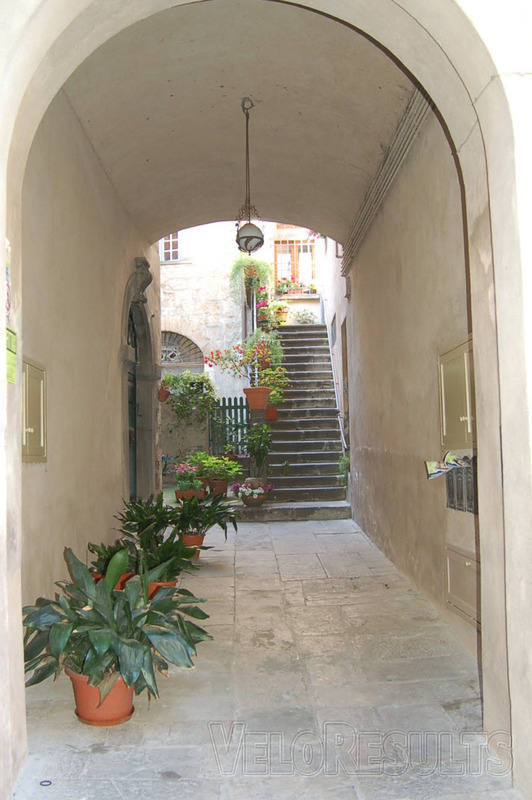 Little alleyways, steeples – a nice place to wander. Those underground caves – alas, we didn’t have time to explore them. 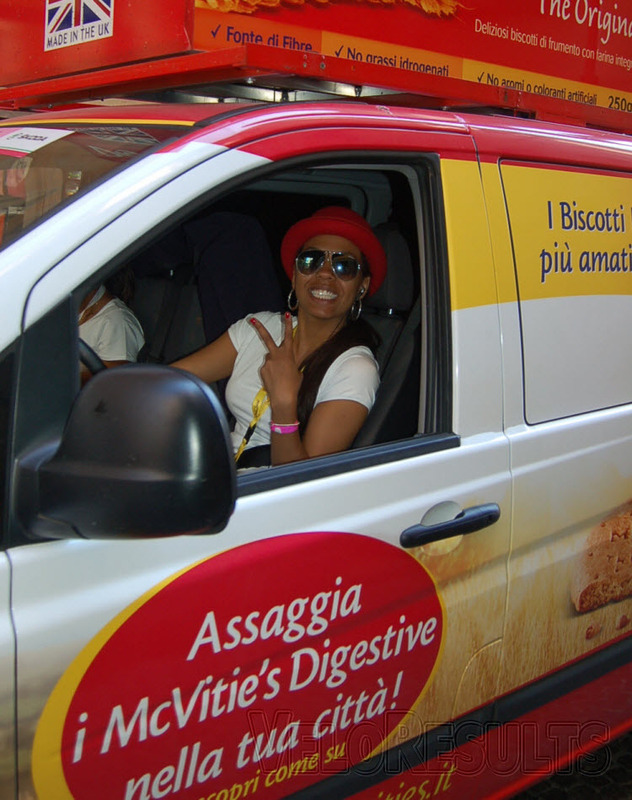 The girls who drive most of the vehicles are without exception, lovely. 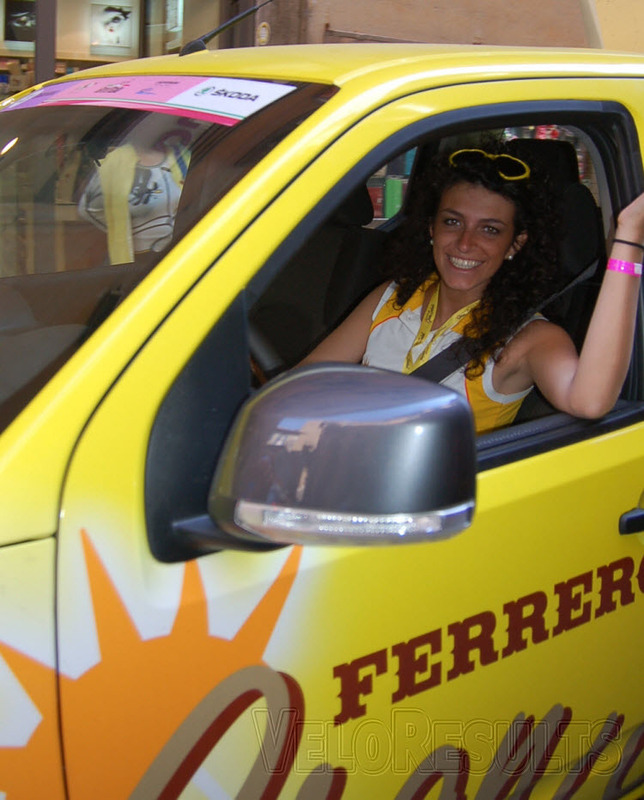 Their beauty is incidental, they’re recruited on their experience and length of time they’ve been driving – and if you believe that, you’ll believe anything. 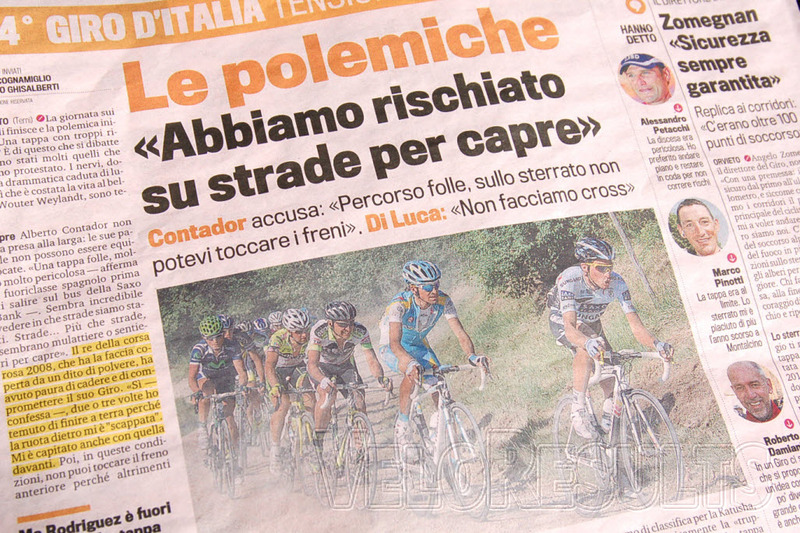 You need your Gazzetta – no Gazzetta, it feels like it’s no Giro. 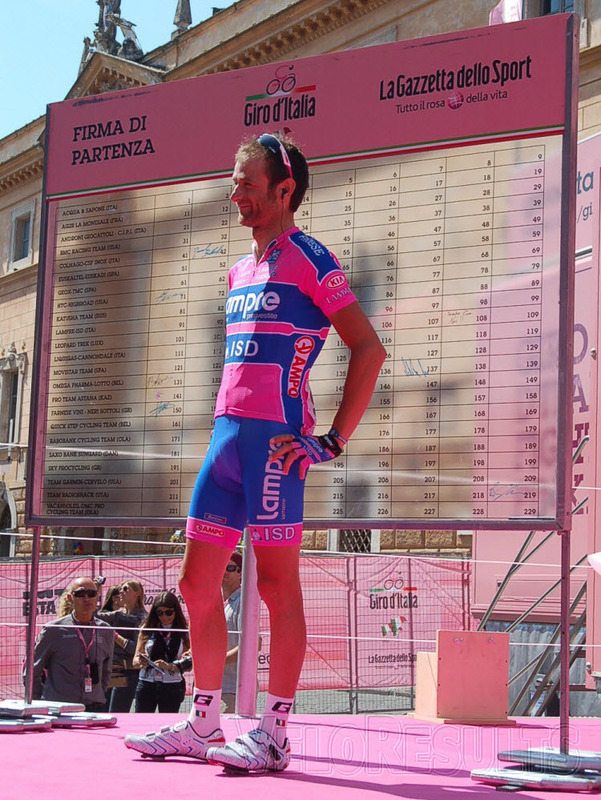 Scarponi signs on and takes a bow. Ale arrives. 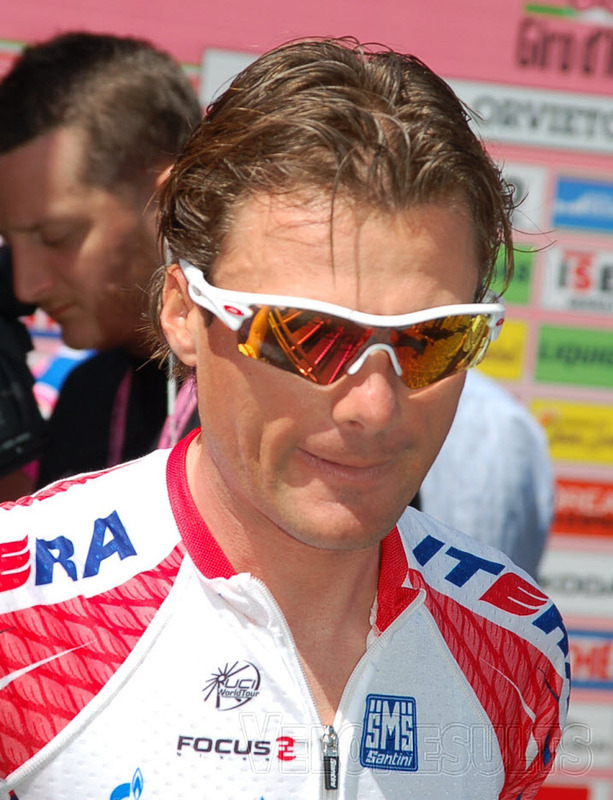 Tall, handsome, tanned, hair gelled back, shades atop his head, the red Punti jersey on his back, that loose limbed slouch. Giovanni Visconti won’t sparkle today. 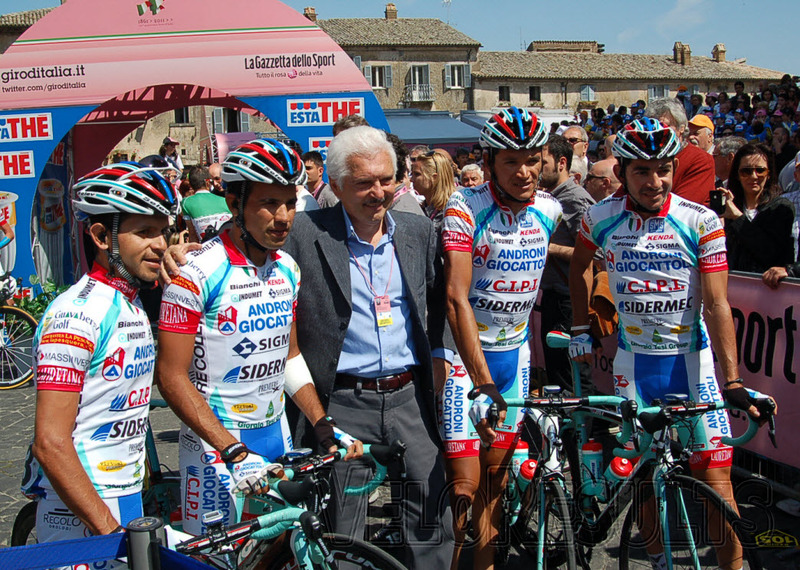 Di Luca, still a factor in the summit finishes? 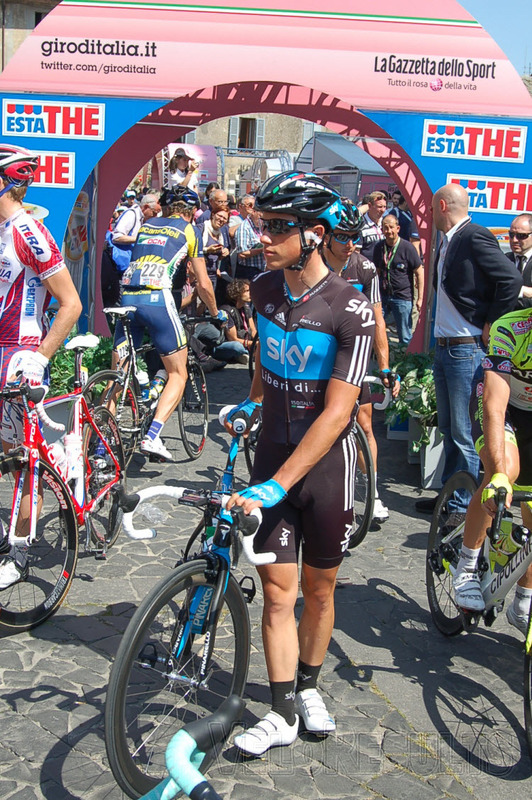 A man who’s surprising in his first Grand Tour is Sky youngster Peter Kennaugh. 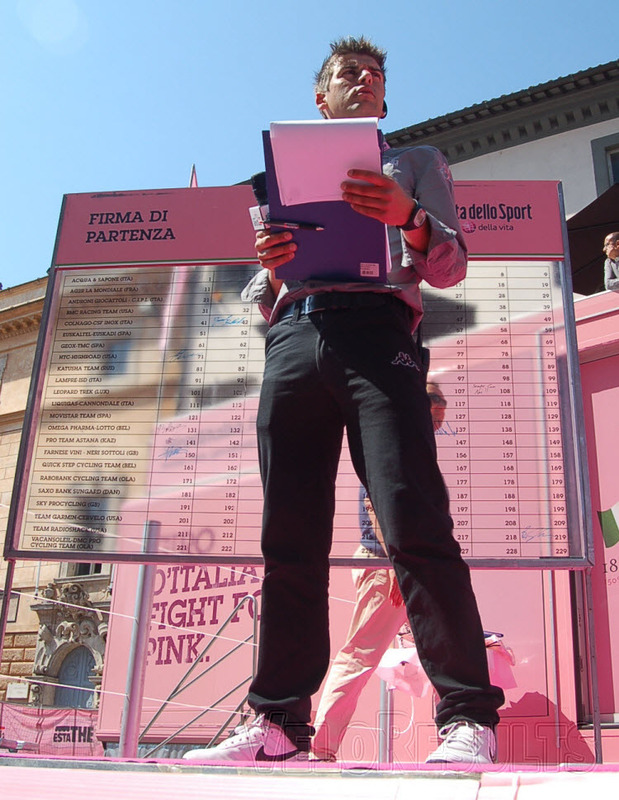 Race Leader Weening beams, waves and there’s a ‘bang!’ as he signs on – shreds of pink paper fly into the air. 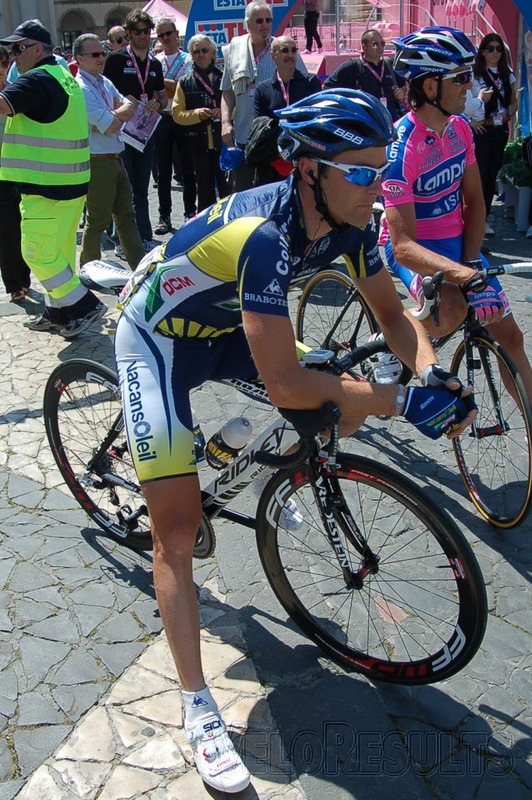 Contador clocks in for another day at the office. 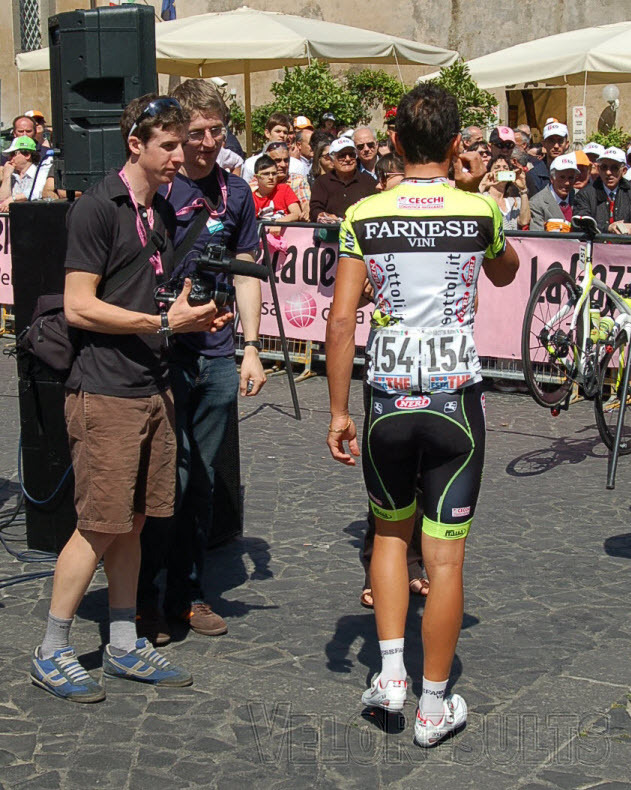 Matteo Tosatto has been a pro since 1997 – there’s little he needs to learn about pro bike racing and exudes authority. Sky really need a Stage win. Last minute change of bikes before rollout this morning.